The Kaltura Media Assignment allows students to submit media for a grade. Submissions can be audio, video, or images. If a narrated PowerPoint is desired, students can download the CaptureSpace Lite desktop recorder to sync a presentation to an audio/video file. 1. Login to Moodle and select your course. 2. Turn editing on by clicking the Edit button at the top right corner of the page. 3. Click Add an activity or resource within a topic/section. 4. 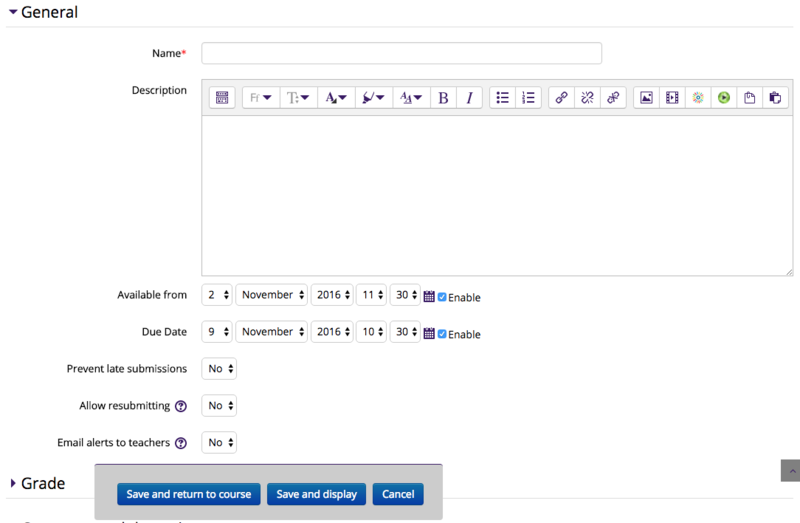 Select Kaltura Media Assignment from the Add an Activity or Resource window, and then Add. 5. Add a Name and Description to the Kaltura Assignment. Setting a due date, limiting late submissions, and preventing resubmission are options you can set. The Kaltura video assignment only allows students to submit one video. Resubmission will overwrite any previous videos that the student had submitted for the assignment. 6. Now add any other optional settings you would like. Restrict access: Place a restriction on access to the assignment. This could be a date, a group of students, date, etc. It is not recommended to use more than 1 restriction. This is an optional setting. Activity completion: Enter parameters that determine completion of the assignment. This is an optional setting. Tags: Add keywords to describe the nature of the assignment. This is an optional setting. 7. Click Save and return to course at the bottom of the screen when finished.